Preheat oven to 375° F. Grease a 9 by 9-inch baking pan. Drain the pinto beans into a measuring cup and add enough water to bring the total liquid to one cup. Set aside. Heat oil and saute onions & garlic over med-high heat for 1 minute. Add beef and spices. Cook & stir 3 minutes until no longer pink. Pour 1/4 cup of bean/water liquid into the pan to coat the bottom. Make 3 layers (cutting or tearing tortillas to fit) in this order: 3 tortillas + meat + drained beans + bean liquid + cheese. Top the third layer with the 3 remaining tortillas. Cover tightly with foil and bake for 20-25 minutes. To serve, top with lots of shredded lettuce and tomato, or serve them on the side. Note: There's lots more on this recipe in my blog, Click here. 30 Comments on "Quick & Easy Taco Casserole"
This dish is better than most tacos I have had. So I’m grateful for you, Jenny, for delivering me from taco hell (pun intended). Also, I can enjoy the recipe as written, or I may tweak it in infinite ways. Latino cuisine is open in that regard. In fact, I’m thinking I might sometimes tweak this into a “chicken enchilada casserole” with chicken, jack cheese, and spinach instead of beans. No more having to cuss out loud because my corn tortillas break when I stuff them…I just go casserole…and cuss about something else out loud. What a country! Mexican restaurant (Tex-Mex) secret. When the meat, onion, garlic and spices are ready to remove from the skillet, add enough water to about 3/4 to cover the beef, then boil on high, stirring occasionally until the water has evaporated. This infuses the meat with the spices and makes a more moist mix. I have now frozen this several times. Re-heat in the micro-wave or oven. The texture will change somewhat and the cheese will not be as melty, but it’s still good. I just realized that my comments are totally incomprehensible. I cook my spices, onion, garlic and meat done before I assemble the rest of the ingredients, then bake until hot through and cheese is melted. For one person about 1/3 of the meat makes a meal. By cooking the meat mixture and freezing, I can have 3 quick meals. Sorry for the confusing other post. You can’t get more authentic Tex-Mex than this. I used home cooked pintos. The juice from home cooked beans is thicker. I don’t recall ever having bought a can of beans. In a relative un-characteristic manner, I made this exactly like the recipe. 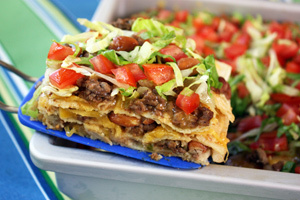 I will freeze the leftovers, from experience with layered tortilla dishes,I know that it will freeze well. I ate it with a simple salsa of fresh tomatoes and Jalapenos, with warm corn tortilla chips fried in olive oil. The reason to shred the cheese yourself is that pre-shredded cheese is coated in cellulose to keep it from clumping, which makes it hard to melt properly. Cellulose? Well, yes, the shipping containers are labeled “Food Grade Sawdust.” I have seen this stuff. Can this be made ahead of time? Like the night before? Or will it get too soggy? Would it be better to make it, cook it and then serve the next day? Thanks for a great recipe! Did you receive an answer to the question of can the the casserole be made ahead and then cooked later? Or did you try it? How can I keep from crying when I cut onions? You can run the onion under cold water before you start cutting it. you can also cut the core of the onion out first because that’s the part of the onion makes your eyes tear. This looks so good I can’t wait to make it. Thank you so much for all your great recipes. I agree!!! I miss you on youtube!! Love you and your wonderful recipes there!! Jenny, you haven’t been sick in 50 years ! Praise God ! When I seen your new recipe I was so excited !!!! Oh how we all hope you will have more time some day to send us more of your recipes. But we understand ! So no mnore videos ever ? Jenny, I saw in a comment that you might be ill? We will keep you in our prayers for total healing. 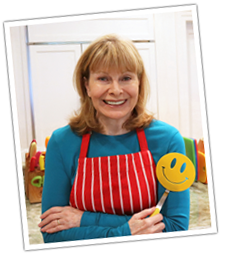 Your recipes have been a huge blessing and we love your sense of humor. Thank you and God bless you. I pray that you know Jesus, the true Healer! Nope. I am quite well – it was just a rumor. I have not been sick in decades. I’m always so happy to see a new email/Recipe from you..Looks delicious. Will be put on next weeks Menu.. Thank you Jenny I’m so excited to try this one,It sounds delicious just like all your others. You are my go to for tried-and-true recipes. Keep them coming you are the best !! The human goal is to busy and happy. I am happy to see your happy and still sharing great recipes. Very glad to hear you are not ill! LOL This recipe sounds amazing!!! Keep the recipes coming please! I am just fine. Some people assumed I was sick because I haven’t made more videos. I just don’t have time. You have made such a difference in my cooking, what a blessing you are. I read a comment that wished you well, I didn’t know you were ill. Lots of love and well wished to you! I think people assume I must be sick or I’d be making more videos. I’m just busy. I am perfectly well, thank you. I haven’t been sick in over 50 years!